Want to be the most popular person at the party? 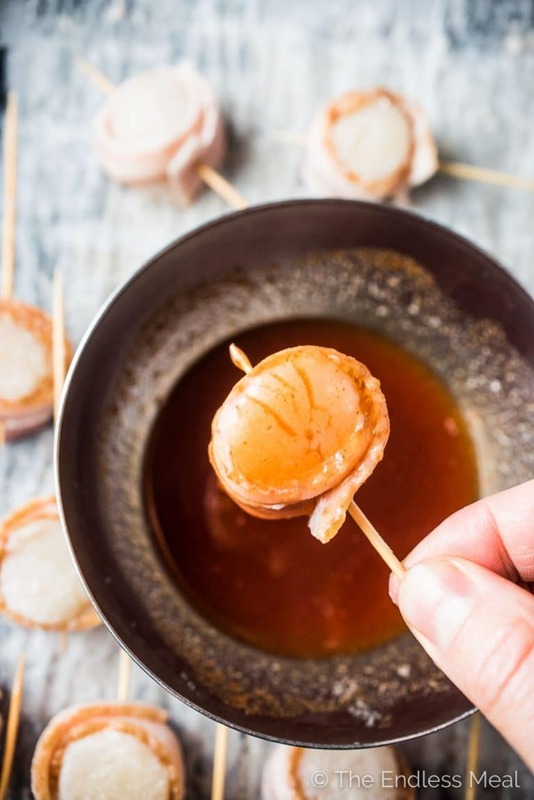 Serve these Bacon Scallop Lollipops and watch it happen. Big, juicy scallops are wrapped in bacon, dipped in a honey sriracha glaze, then broiled until the bacon is crisp and the scallops are perfectly cooked. They are irresistible. Pretty much all my life I've imposed a strict ‘no Christmas talk before December' rule on myself. Now here I am, creeping all too near forty, and I'm about to break my rule for the second time this season. I'm planting half the blame on these bacon scallop lollipops and the other half on all the Christmas parties around the corner. 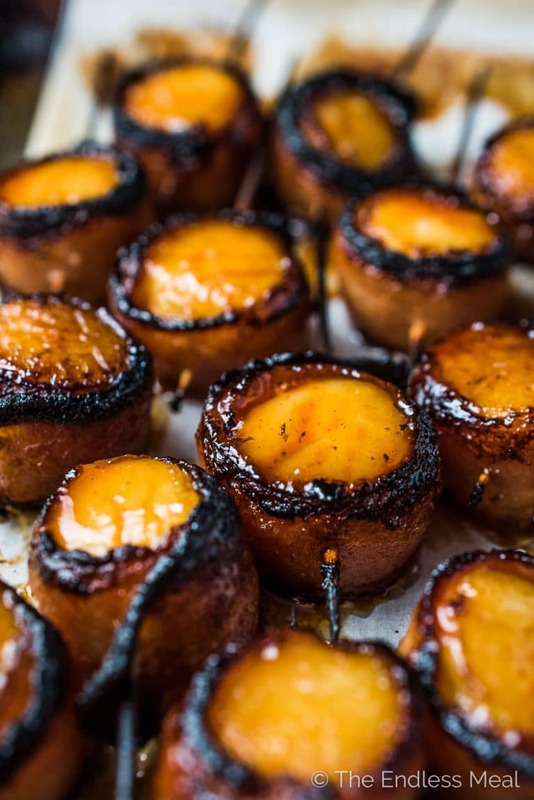 And in case you haven't guessed it yet, these bacon wrapped scallops should be your go to party appy this season, and every year forever and always. They are super easy to make, can be prepped ahead of time, and (most importantly) and insanely delicious. I've made these Bacon Scallop Lollipops with Marina del Rey scallops. Have you had them before? They are sustainably caught, wild scallops and are better than any scallop I've tried. 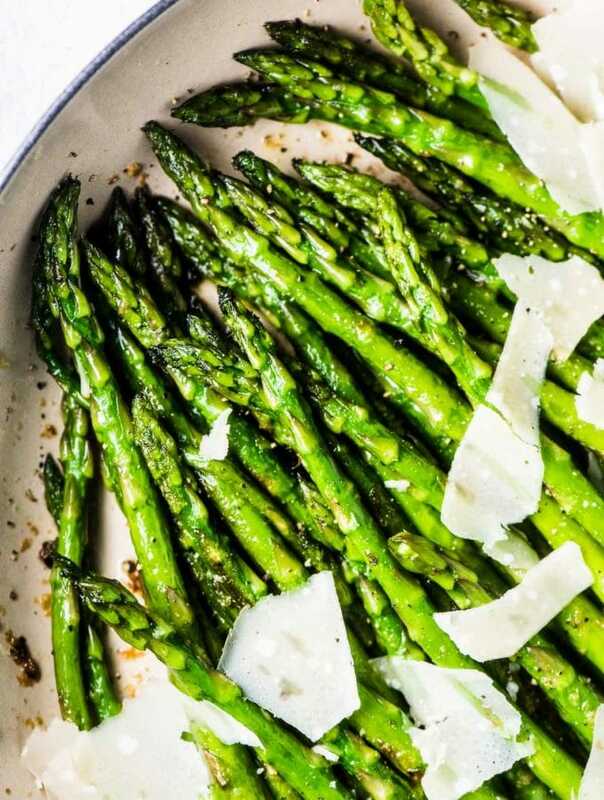 They are plump, sweet, juicy and so delicious. Since trying them for the first time only a month ago, I've already gone through four bags. ← That's the truth! Scallop-fest. Marina del Rey scallops (and my other crush, their Wild Argentinian Shrimp) are both the highest quality wild seafood. They add no water or chemicals, like other brands. And because they're wild, you never have to worry about things like antibiotics, hormones, color, and chemicals that are found in farmed seafood. They're also super healthy for you. Scallops are high in protein, low in calories, and rich in Omega 3s. Maybe it's because they're wild, or maybe it's because of the cold Icelandic water they grow in, but these scallops are the best. Marina del Rey scallops are available across Canada. Visit this page for a list of retailers. Marina del Rey is giving away a trip to Iceland to celebrate their new product – Wild Icelandic Scallops. Also, I'm going to be ridiculously jealous (I mean happy for you) if you win. I've been toying with the idea of going to Iceland this year before Ava turns two and we have to buy her a seat to herself on the airplane. It looks gorgeous there! The northern lights, the stark landscape, the thermal pools, the setting of many Game of Thrones scenes. Maybe we'll see each other there? I've placed the entry form just above the recipe. Make sure you enter! 1. Prep the bacon. Cut the bacon in half then cook it for a few minutes while the oven is preheating. You don't want it fully-cooked, just a little. Cooking the bacon first means the scallops won't overcook. 2. Wrap the scallops. Let the bacon cool for a minute then wrap it around the scallops. I find it easier to cut a little off the bacon so that each strip is the same height as the scallops. I save the little scraps and have them for breakfast. Twist a toothpick through the scallop to hold the bacon in place. 3. Make the glaze. Mix some honey, sriracha, and lime juice in a small bowl. Dip each lollipop in the glaze. 4. Broil the bacon scallop lollipops. You may want to take the battery out of your smoke alarm, or at the very least open the window. There will be a bit of smoke. It's par for course when broiling these babies. 5. Eeeeeaaat. All. The. Scallops. Repeat. Want to be the most popular person at the party? 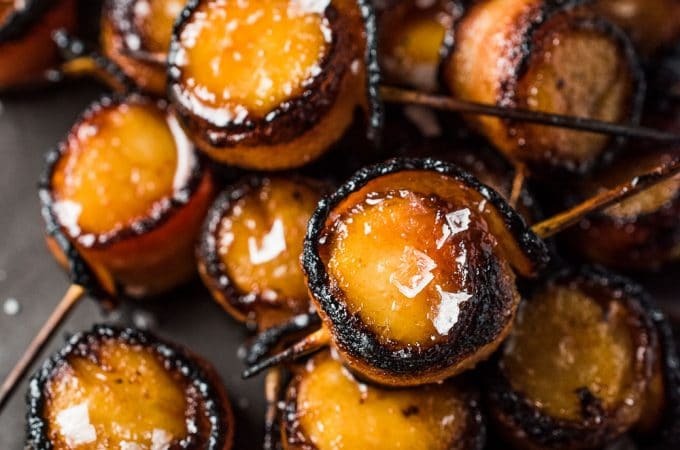 Bring these Bacon Scallop Lollipops and watch it happen. Big, juicy scallops are wrapped in bacon, dipped in a honey sriracha glaze, then broiled until the bacon is crisp and the scallops are perfectly cooked. They are irresistible. Place a baking rack on the top shelf in your oven (and keep the other in the middle) and turn your oven to broil. Place some toothpicks (you'll need about 20) in a cup of water. Cut the bacon in half then place them on a baking sheet in a single layer. Place the bacon in your oven for 5-6 minutes on the middle rack, while your oven is heating up. You want the bacon to just start to cook, but still be pliable enough to wrap around the scallops. Remove the bacon from the oven and it cool slightly. While the bacon is in the oven, mix the honey, sriracha, and lime juice in a small bowl. Wrap one piece of bacon (1/2 slice) around each scallop and secure in place with a toothpick. Dip the scallops in the glaze and place them on a baking sheet. Place the scallops in the oven on the top rack and broil for 5 minutes. 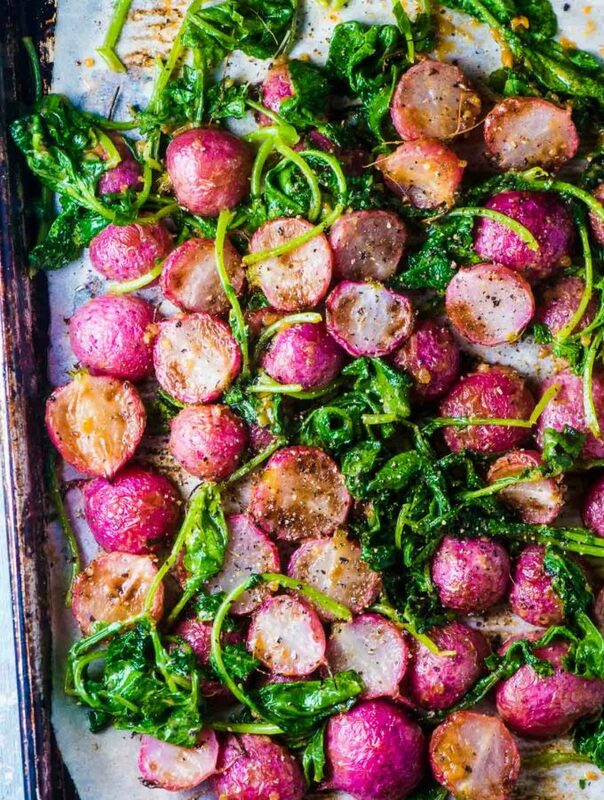 Take the baking sheet out of the oven. (If there is any liquid on the sheet, carefully hold the baking sheet over your sink at an angle and drain the liquid.) Flip the scallops over and spoon any remaining glaze over the top. Broil for another 5 minutes then serve right away. Are these guys ever good!! The only thing I’d suggest is to double the recipe. They went so fast! I LOVE bacon wrapped scallops! Your way of making them into lollipops with honey sriracha is REALLY speaking to me. Anyone serving these to me would totally be my favorite person!! Haha I know what to serve you!! Just so fabulous and perfect for this time of year! Who can resist them? 🙂 Those scallops look perfect and loving all the flavours here. From my experience, no one can resist them! These look so easy and would be the hit of every party! I love the sweet & spicy flavors — these look just amazing! Love the bacon wrapping these tasty scallops and awesome giveaway too! Bacon and scallops were made for each other! Honey, sriracha and lime with bacon and scallops? I am drooling right now. The sauce must be terrific and of course bacon is always a great idea. We love the Marina del Rey shrimp and scallops and can’t wait to give this a try! Brilliant and beautiful. Aren’t they the best shrimps and scallops? We always have some in our freezer! What a fantastic recipe. I love scallops! Can’t wait to try it. Thank you so much! Marina del Rey scallops are the best! Oh wow, if you put a plate of these down in front of me I would not be able to control myself, these are a must for Christmas day, but I don’t think I can wait that long, I guess I’ll need to do a taste test or two first 🙂 Love Marina Del Rey! You’re not the only one! They disappear ridiculously fast!! These look heavenly!! Absolutely divine and succuelnt, not to mention cute!! They would be perfect for entertining, can’t wait to try them! They really are perfect party food. I hope you love them as much as we do!! Wonderful! 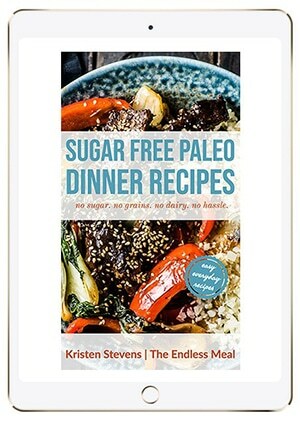 Love your recipe, Kristen! I cannot wait until Marina Del Ray scallops will become available here, in the US. When they do you should definitely try them. They are my favorite scallops!! These look fantastic! I love that beautiful glaze. I bet they disappear quickly! They totally do! You don’t want to walk away from the food table or you might not get any lol! This is insanely beautiful and so delicious looking– I want to jump into the photos! These would be such a hit at EVERY gathering they were at. I am sure 1 bag of scallops would NOT be enough. Sharing EVERYWHERE Kristen! Thank you so much! You’re right about them being a hit. They go so fast. The great thing is that you can prep tons ahead of time! These are the prettiest scallops! And dripping with fantastic flavours. Oh my gosh, Kristen, I’m so excited about making these for the holidays. They will be perfect anytime!! You should definitely make them! They’d be perfect for your holiday parties! !